Anna McQuinn is the author of more than twenty books for children, including Wanda’s Washing Machine (Tiger Tales). She also works part-time as a librarian, running family book groups. Anna lives in Slough, England. 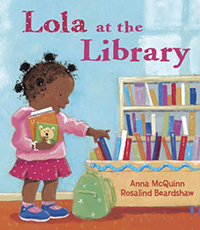 On Tuesdays, spunky Lola and her mommy go to the library. Everything about the trip is an exciting adventure—from packing her backpack with books and her all-important library card, to story times and singing, to choosing new books, and the walk home. But the best time of all is when Mommy reads her a story at bedtime. Come with Lola on her favorite weekly trip in this celebration of books and the people who love them. Simple text and bright acrylic illustrations are perfect for instilling a love of libraries and books in the youngest patrons.